For the longest time, I have been thinking about how I can share useful websites with my students and their parents to help them practice their French at home. This is guaranteed to be on every parent's mind when they come in for curriculum night and parent-teacher interviews. In the past, I have resorted to providing a brochure with some links typed up but the urls were often lengthy or, in some cases, they would no longer work. Then there was always the possibility of the brochure being misplaced. For the most part, I would list general sites since in any given year I could be teaching grade 1 all the way to grade 8. This was clearly not the best option for sharing online resources with parents. This is why I am making the switch to Symbaloo EDU. Symbaloo EDU is a free social bookmarking site that allows to you manage all your resources in the cloud by creating visually appealing webmixes that can be shared, updated, and even embedded into a web site. They can be accessed anywhere through the Internet and on any device. You can also created "lesson plans" that will guide students from tile to tile, where you can direct them to a useful website, have them watch an embedded video, embed a file from your Google Drive and have them complete a quiz before advancing to the next tile, all at their own pace. Finally, teachers can create their own Personal Teaching/Learning Environments and use them as their homepage for quick access to educational sites and resources. 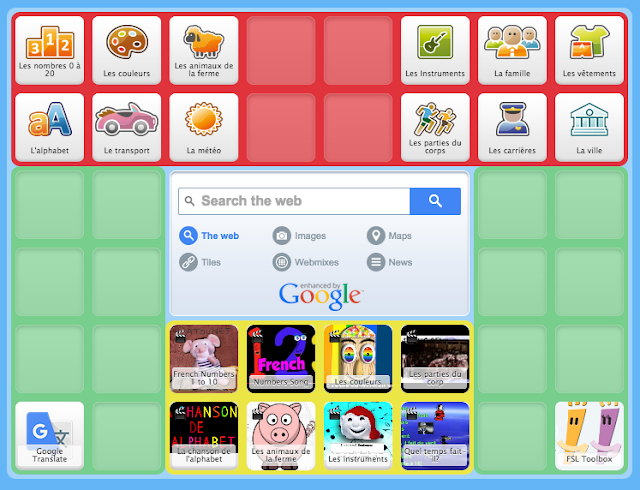 Above is an example of Symbaloo EDU webmix I created for my Primary French students complete with fun videos and several Quizlets on key vocabulary we cover throughout the year. The best part is that I can add to or edit it whenever I like and they will always have the most updated links. If you've been using Symbaloo.com and are curious about how it differs from Symbaloo EDU, the main difference is the content that you start with. 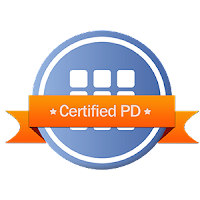 SymbalooEDU accounts come with preset educational webmixes preinstalled that are continuously updated with the latest and greatest educational sites recommended by Symbaloo Certified educators, such as yours truly. Over the next few weeks, I am going to attempt my first French Symbaloo EDU lesson plan. If you are an FSL teacher who has already completed one, feel free to share via the comments below. Thanks for sharing this. It will be handy when casually trying to teach my grandkids French! Excellent! I'll be adding more the webmix above throughout the summer. Lots of handy applications, for sure. Looks like they have great applications, I will have to check it out more and see how it works. Thank you for sharing! My sister and her adult children speak French and English.Sadly I can only speak English. Thank you, my French is abysmal so anything like this for my children is so helpful. Oh wow, this interface looks really user-friendly and attractive. I'll be sharing this with my sister!